Engineering Council of South Africa confirms what we at CUT already know – our Engineering and IT programmes are first rate! CUT’s Engineering Diplomas and BTech degrees have achieved accreditation from Engineering Council of South Africa which is amongst the most respected accreditation bodies in South Africa. It is a statutory body that was established in terms of the Engineering Profession Act of 2000. The Council has provides leadership through rigorous quality assurance processes and demanding standards that are widely accepted within higher education sector and professional bodies. 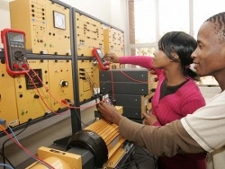 The accreditation of CUT’s engineering programmes is the culmination of the Strategic Transformation of Educational Programmes and Structures (STEPS) process at CUT that began in 2010.